GUADALAJARA, Mexico – Mack Trucks is strengthening its presence in the Mexican market, by bringing its new Anthem highway model here and focusing on expanding its dealer network. Mack has had a presence in the Mexican truck market for 117 years, and emphasized during a press conference at the ExpoTransporte trade show that it’s here to stay. Mexico represents the second largest economy in Latin America, and has a growing road network that already covers 176,000 kilometers. Saenz said the brand will focus on growing its dealer network to better reach customers throughout the country. Emerson Gutierrez, Mack commercial director, Mexico, was equally enthusiastic about the new Anthem. The Anthem is about 3-7% more fuel-efficient than its predecessor, noted Gutierrez. Anthems will be offered in day cab configuration, and with 48- and 70-inch sleepers. The Mack Anthem in Mexico will come complete with all the latest technologies offered in the U.S. and Canada, including GuardDog Connect telematics, and the mDrive automated manual transmission. 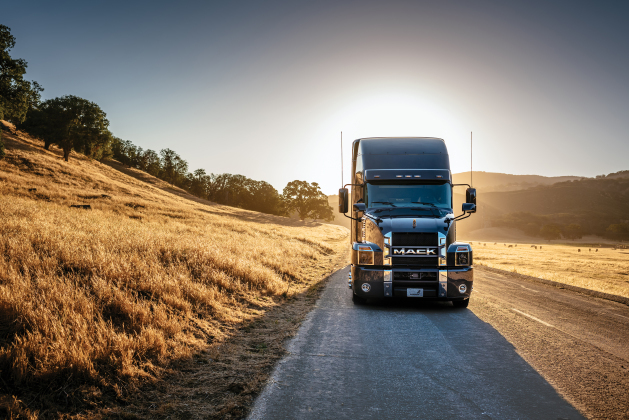 John Walsh, vice-president of global marketing and brand management for Mack, said since its launch in the U.S. and Canada, the Mack Anthem has attracted plenty of interest. He said the Anthem makes Mack a stronger player in the large sleeper, linehaul segment of the market. Mack introduced its new Anthem highway tractor to the Mexican market at ExpoTransporte.